Debuting the first of my new pants I scored from JCP clearance online in preparation for Fall…. I am looking forward to several ways of styling both these jeans and the new knit grey jacket. The top, shoes and purse are all thrifted. This sheer top has colors that are perfect for fall and layering under a jacket. For winter I might add a tank underneath as well. Due to the tassels on the front, I kept accessorizing to a minimum with drop earrings and the headband. Prior to blogging I would have been much more matching ,perhaps with a black jacket to bookend the shoes and the tassel. I love that I reached for the grey jacket instead. Adding the purse color to pick up the color in the shirt instead of matching the shoes is also a sign of my growth after one year of blogging! Dear Readers, I loved the little tease of cooler temperatures this weekend, but will go back up to 80 ‘s all next week. We are getting cooler temps at night in the 60’s so may do evening shots so i can jump into Fall clothes I am itching to wear! I hope you all had a wonderful weekend. These first two weeks of homeschooling were tough and I am hoping in the next two weeks, we hit our stride and get use to the new schedule. Are you ” in the groove” of Fall schedule if you have children still in school? I know I am going to miss this crazy time soon when it’s no longer a part of my life….. I am grateful that my sinus problems seem to be turning around quickly. I am grateful that my husband and kids had a great time together on his birthday at the company family picknic. I am grateful that the kids are all worn out from the day and will get to bed on time tonight. 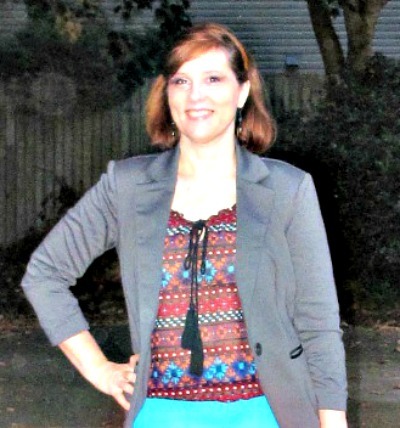 6 Responses to "Teal Pants and Cooler Temps…"
Great colors in your outfit. I especially love the colors in the top and purse. I would have absolutely reached for a black blazer without a second thought. Kudos for thinking of the gray because it works extremely well. Have a nice week, Tracey. 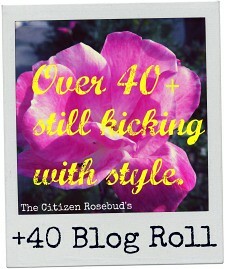 thanks, it’s nice to learn something new and put it into use… a great benefit to a year of blogging! 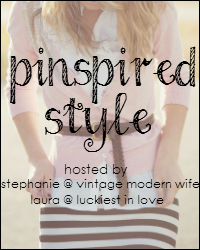 We bloggers inspire each other and it’s a great community! Oooh, pretty pants and they fit you so well! Nice color choice with the bag! My kiddos have been in school since the end of July, so we’re definitely back in the swing of things. But recently we added football and scouts to the mix, so it’s getting a little nuts around here. I forgot how busy fall can be! Really great looking outfit and I absolutely LOVE those sandals!